Undoubtedly the ultimate flying toy, the AR.Drone 2.0 represents the latest development of Parrot's world renowned high tech quadricopter, that is easily controlled by Wi-Fi using a smartphone or tablet. It features a high definition camera with a video recording facility, plus flight data sharing, a patented piloting mode, and an innovative pressure sensor for increased stability at any altitude. Parrot's outstanding AR.Drone 2.0 offers just about every possible option on the enthusiast's wish list, and can even perform 360 degree flips on command! The horizontal forward facing camera transmits real time video, showing exactly what the quadricopter sees on the smartphone's screen. It has a 720 pixels HD resolution, streaming 30 frames per second. For gaming purposes, this camera can also recognise specific shapes and colours to show augmented reality elements on the screen. Now you can record and share your flying experiences with others, thanks to the new AR.FreeFlight 2.0 piloting application. Additionally with the Travelling Feature, the pilot can film HD video sequences like a professional. Simply select the direction of travel, plus the duration, and the AR.Drone 2.0 does the rest automatically. Absolute Control introduces an extremely useful ultra intuitive flight mode. Thanks to Parrot's patented new Absolute Control mode, the player accesses an even more intuitive piloting system. With a 3D magnetometer, the AR.Drone 2.0 knows its precise position with respect to the smartphone, which becomes the reference point. The pilot no longer needs to worry about the orientation of the AR.Drone 2.0. Experienced players may still select Relative Flight Mode, to switch back to conventional control. This disables the magnetometer, and the pilot can manage the quadricopter's orientation without assistance. Surprisingly stable at any altitude, the AR.Drone 2.0 contains several micro electromechanical systems, a 3-axis accelerometer, a 3-axis gyroscope, a 3-axis magnetometer and a pressure sensor to correct the alignment automatically. The quadricopter generates its own Wi-Fi connection, with a range of up to fifty metres. It will fly continuously for twelve minutes with the 1,000 mAh rechargeable lithium polymer battery provided, whilst recharging from the mains in an hour and a half. Four high performance propellers, specially designed for the AR.Drone 2.0, make exceptionally smooth flights possible. A second vertical camera placed beneath the quadricopter, can be selected to show live video on screen, and additionally measures the craft's speed using an image comparison system. 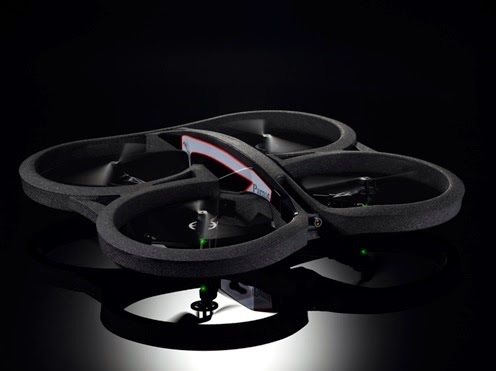 Suitable for beginners and experts, the AR.Drone 2.0 features a tough carbon fibre central cross. It is supplied with two distinctly different hulls, made of flexible expanded polypropylene foam. They are both highly resistant to impact, and protect the more delicate internal parts. For outdoor flight, the lightweight streamlined hull reduces wind resistance and preserves the quadricopter's excellent handling and stability, even in a light breeze. When operating the AR.Drone 2.0 with the indoor hull, the four foam rings protect the blades, and your furniture from impact. The first quadricopter to be flown with an iPhone®, iPod touch® or iPad, an Android facility is now available to allow the AR.Drone 2.0 to recognise the majority of leading brand smartphones and tablets. A compatible device is required for operation (Not included). A 12 month Parrot manufacturer's warranty provides cover for defective parts and workmanship, subject to proof of purchase, but clearly does not include damage in use. A full range of replacement parts are available separately. Gift Frenzy. Simple theme. Powered by Blogger.